Google has taken video chat to another level with its Google Plus Hangouts. Commentators report that this feature is the real groundbreaking aspect of Google+. Unfortunately, Google+ Hangout has not really taken off yet as Google+ members are still trying to come to grips with the many features and implications of Google Plus. Google continues to innovate in this area and has recently created further refinements based on user feedback. Google Plus Hangouts provide many opportunities for small business marketing through connection with your customers or clients. You can also connect with your friends and staff. The only requirement is that the people you connect with on Google+ Hangouts have to be in your circle and they have to have you in their circle – so this requirement is a basic privacy element of Google Plus. There is also a limit on participation numbers – at the time of writing the limit is 10 participants. You will be advised when the installation of the plugin is successful and you will have the option again to setup a Google+ Hangout. When you have the plugin installed and click the “start a hangout” button your will be taken to the Green Room – effectively the waiting room before you go on air (you can even check out your personal appearance beforehand!). 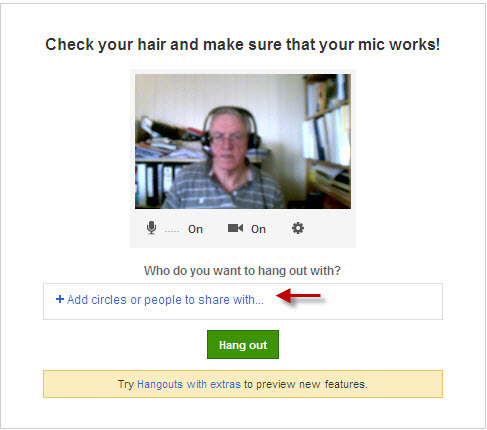 From within the Green Room, you can add individuals or circles to your Google Plus Hangout. You click on the ‘+Add circles or people to share with” button and you will see a drop-down menu of your circles so you can specify which circles you want to communicate with (this is where setting up and naming your Google + circles becomes really important, e.g. creating a customer circle for customer communications and surveys). In the Green Room, as illustrated previously, you will see icons for audio, video and settings (working from left to right). If you click on the audio or video icons, you will mute the relevant equipment. 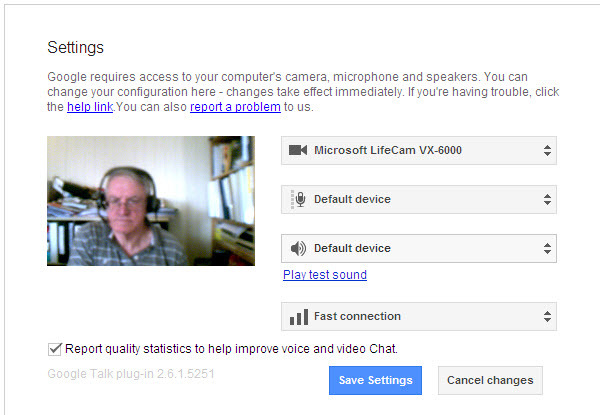 The settings icon enables you to advise Google Plus of the source you wish to use for your video (webcam), audio and volume controls. You will be able to choose from the dropdown menu for each of these pieces of equipment. 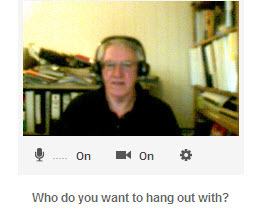 From my experience, Google Plus automatically activates my webcam when I click on “Start a hangout’ (even when I have not switched the webcam on myself). Remember to click the ‘Save Settings” button when you have finalised your settings. The thing to remember is that the Green Room is for setting everything up for your hangout (even yourself). You or your Green Room are not visible to others until you click on the green ‘Hang Out’ button in the Green Room. Google Plus Hangouts provides a great opportunity for small business marketing by enabling video chat with your circles (including your customers and friends).